The wedding took place yesterday of the very lovely Miss Brigid Leahy, daughter of Mrs Josephine and Mr Jimmy Leahy, to Mr Daniel Dunne, son of Mr Sean O’Sullivan and the Late Ms Virginia Dunne. Their marriage took place in the 18th century Church of St. Kieran, Johnstown, Co Kilkenny, with the ceremony conducted by the parish priest and close family friend, Rev Fr. Francis Maher. Escorted down the aisle by her father Jimmy, the bride looked stunningly beautiful in a full length A-line afternoon wedding gown with Sweetheart Design lace bodice, decorated in minute beaded flower detail. Equally beautiful were her Matron of Honour, Jane Landers and her three accompanying Bridesmaids; Louise Stapleton, Rosemary Bowe and Kaylyn Stapleton, latter who all wore full length Egg Plant Chiffon Aubergine gowns, highlighted by vintage jewelled accessories. The Groom Daniel and his Best Man, Mr Seamus Stapleton, together with Groomsmen, Mr John Dunne and Mr Jamie Dunne all looked dashing in black morning suits, with white Wing Collared Shirts, silver and white waistcoats, elegantly highlighted by magenta and white Cravats. 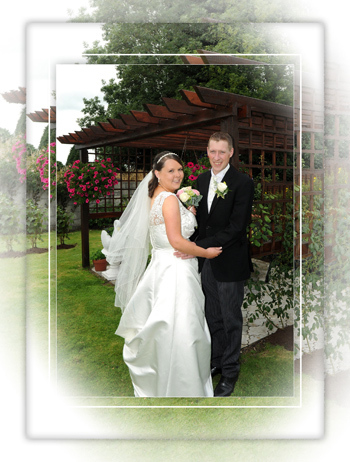 Also adding to the splendour of this occasion were Flower Girl Miss Aimee Dunne and Page Boy Master Daniel Stapleton. The couple proclaimed their love for each other in front of over two hundred family members and close friends. Passages from Scripture were read by Eva Maria Dunne and Ciara Conroy, while Prayers of the Faithful were read by David Whiteford, Joshua Whiteford, Kathleen Doyle, Tina Dunne, Christopher Leahy and Keith Landers. Offertory gifts of Bread & Wine were carried by Josephine Leahy and Bridie Dunne, while James Stapleton recited the customary Communion Reflection. Following the marriage ceremony, the new Mr and Mrs Dunne retired to the beautiful gardens of the Leahy family home, for family photographs and refreshments, before going on to the Castle Arms Hotel, located in the beautiful Georgian village square of Durrow, County Laois, here in the Irish midlands. Here guests were met by General Manager Mr Joseph Murphy, before being entertained to a Champagne reception, together with a host of other light refreshments. The newly married couple later joined their guests in the venues main Banqueting Suite for dinner, which was immediately followed by dancing very late into the evening. The couple have chosen Paris, most populous city of France, as their honeymoon destination and so to Brigid and Daniel go all our best wishes for a happy, healthy and prosperous life together, from all your family and many friends.